And, celebrate we did!! 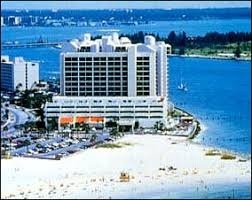 The Clearwater High School Class of 1968's 50th Birthday Blast was held at the Adam's Mark Hotel on Beautiful Clearwater Beach. Although Hurricane Gordon affected the activities somewhat, it was still a fabulous weekend with the best hospitality suite EVER. And, we had fun with the news crews that were in the parking lot reporting on the hurricane. They picked that area because the waves were "crashing" on the rock jetty and made the storm look much worse than it was. However, the storm did take it's toll by making some people stay home and we didn't make our bar minimum. It was the only reunion where we "lost" money. The kick-off party at the Palm before the 30th Reunion was so successful that we decided to try it again. There are pictures on the "Pictures" tab. Registration was held in the Hospitality Suite where classmates enjoyed beautiful views of the Gulf and the Bay. Attendees enjoyed hors d’oeuvres and a cash bar. The volleyball court was reserved, and a Steel Drum band provided entertainment. Dress was very casual. The Hospitality Suite was open for late-night socializing! BYOB. The Hospitality Suite was open all day. There was board games and football on the TV. And, it was BYOB. A cash bar was provided. Dress was casual and Hawaiian attire was suggested. Saturday’s Hawaiian Luau theme found delicious food on our tropical buffet. Dancing to the smooth sounds of The Local Tourists will follow.